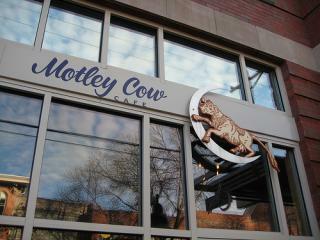 The Motley Cow serves food that reflects the seasons and the weather. We change our menu regularly to represent the local products available to us. Knowing our sources personally gives us confidence in the quality of each ingredient and the method with which it was raised. During the summer harvest, we source about 85% of our vegetables from Johnson County. We use local beef, lamb and pork as frequently as possible to assure humane conditions for the animals, living wages for their caretakers, and responsible proprietorship of the land. We use local products to minimize the carbon emissions of our deliveries. We use local products to support the agricultural heritage of Iowa and Johnson County.